Angelina faced a problem. Her husband had recently undergone emergency surgery. Now, he was out of work. How, Angelina worried, would they support their four children? The bills paid up. The landlord threatened eviction. Angelina was out of options. 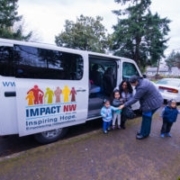 She shared her story with Grecia, one of Impact NW’s home visitors. Grecia had been supporting Angelina in raising her young children. “I could hear how hard this was for her, not knowing whether she would be able to keep the lights on or keep her kids under a roof,” Grecia says. Grecia recognized another way to help. 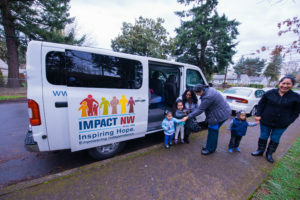 Impact NW offers an Energy Assistance program (made possible by generous donors such as NW Natural and Pacific Power), where clients can receive support paying outstanding bills. She contacted her colleagues at Impact NW and arranged for Angelina to receive funds to pay her utility bills. The support was just what Angelina needed. The family stabilized and was able to keep their home. Angelina’s story shows the transformative power of Impact NW and how, in everything we do, we work every day to stabilize and strengthen lives before it’s too late.